The State Department of Education, in response to several phone calls and emails released a myth fact sheet in an attempt to dispel these purported myths with fact. Unfortunately they provided only statements and very few actual facts. As Idahoans we deserve to know what Common Core will really mean for us and for our children. This paper is a response to the Idaho State Department of Education. This response has documentation and endnotes. We invite you to read the documents for yourself and decide if this is the future you want for Idaho. 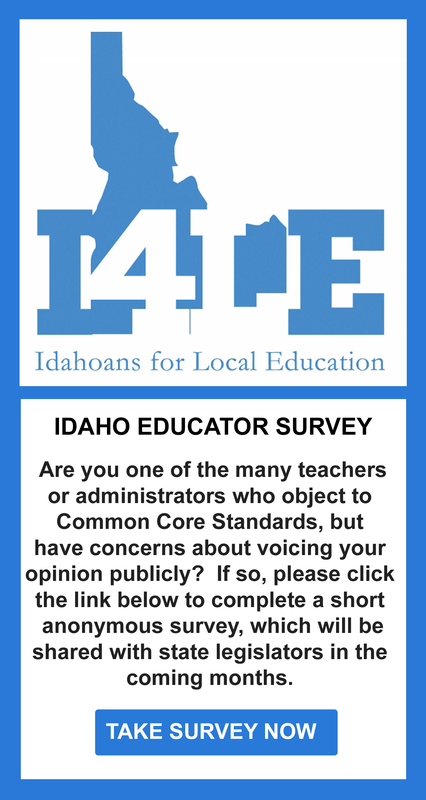 SDOE Myth: The federal government has required Idaho to adopt Common Core State Standards. SDOE Fact: The U.S. Department of Education has never dictated which standards a state has adopted, even under No Child Left Behind. The federal government has never reviewed a state’s standards, and they have not reviewed these standards. These standards were the result of a state-led effort. Idaho signed a Memorandum of Agreement with other states that clearly defines this as a state-led effort in which the federal government is not involved. This is evident in the fact that not every state has adopted the Common Core State Standards today. Each state reviewed these standards and made their own decision. This application was our first step on the path to common core, a federal requirement, if our state wanted to qualify for Race to the Top and other federal education grants. Our state officials decided that federal funds were worth the federal strings. Even more alarming is the Cooperative Agreement Idaho leaders accepted with the Department of Education as part of the SBAC. This agreement with the SBAC and the U.S. Department of Education requires even further oversight. The details of our agreement are explained in detail in the Cooperative Agreement Between the U.S. Department of Education and the Smarter Balanced Assessment Consortium and the State of Washington Article II Project Management Plan.4 Some of the most alarming are a mandate to “work with the Department to develop a strategy to make student-level data resulting from the assessments available on an ongoing basis”. Another troubling aspect of the agreement is the consortium’s mandate to run all decisions by an employee of the USED. This employee is referred to as a Program Officer. They have the final say over how our Idaho State assessment testing will be written and implemented. “The Program Officer will review and approve modifications to the design of activities proposed under this Agreement. Any recipient requests for changes shall be submitted in writing directly to the Program Officer. Requests are not approved until the grantee has received authorization and notification in writing from the Program Officer”.5 The program officer is a U.S. Department of Education employee, not a locally elected, held accountable individual. Idaho students will now be tested according to these Common Standards, only after the federal employee has verified our tests as acceptable. SDOE Myth: States must adopt the Common Core State Standards if they accepted federal stimulus funding, Race to the Top grants or received a federal waiver from No Child Left Behind. SDOE Fact: No state has to adopt the Common Core State Standards. This was a state-led effort that is completely voluntary. The U.S. Department of Education has tried to incentivize states to raise their academic standards in core subject areas through Race to the Top grants and the federal waivers from No Child Left Behind. However, states like Virginia that have chosen not to adopt the Common Core State Standards still received a waiver. No requirement exists. This is completely voluntary for states. Idaho adopted these new standards because we believe they are the best path for Idaho students. SDOE Myth: These standards will dumb down education in Idaho. SDOE Fact: These standards are considerably higher than the previous standards Idaho had in place for mathematics and English language arts. The state has chosen to adopt these new standards because they are higher and more rigorous than Idaho’s previous standards. Our colleges and universities as well as the business community have told us that students who graduate with mastery in these standards will be prepared for the rigors of postsecondary and the workforce. This is something we have been working toward for years because today only 47 percent of Idaho’s high school graduates go on to postsecondary education and, of those, nearly half need to take remedial courses once they get there. In addition, these standards are comparable with the standards of any other country in the world. To see evidence of the difference in standards, you can look at the gap analysis Idaho conducted to compare our previous standards to these new standards or see what Idaho teachers and school administrators have to say about the standards. Documented Fact: The supporters of Common Core are not able to provide any substantive evidence that these standards are considerably higher. Achieve, the authors of the Common Core Standards did the only gap analysis. This gap analysis states “99% of the Idaho ELA Standards were a match to the Common Core ELA Standards.” 7 The study further explained, “84% of Idaho’s K-12 math standards were matched to the Common Core”.8 These reports make reference to a Side-by-Side comparison spreadsheet, but this document does not seem to be available at this time. This would indicate that our previous standards were very similar, with a small percentage of additions. What are these additions and how are they better? The final version of these standards didn’t come out until June 2010. During the writing process several members of the Validation Committee asked to review research evidence. This request was routinely denied. When the final version was available five members of the Validation Committee declined to validate the standards.9 They have not been researched or tested, there is no evidence that they will improve on existing standards, or lessen the achievement gap. The bottom-line, it is an expensive proposition to re-do our entire Idaho education system without empirical evidence that we are moving in the right direction. SDOE Myth: Because Idaho adopted these new standards, it must upload student identifiable data into a national database, including details such as family income, family religious affiliation, and parent’s education level and biometric data (iris scans, DNA, and fingerprints) from students. SDOE Fact: These are academic standards that set goals for what each student should know and be able to do by the end of each grade level. These standards are in no way tied to the statewide longitudinal data system. Idaho implemented its statewide longitudinal data system back in 2009, two years before the state chose to adopt these new standards. Idaho’s statewide longitudinal data system is not tied to a national database in any way. Neither the state nor local school districts collect data on things like religious affiliation, nor do we have the technology to collect any biometric data from students or staff. Documented Fact When Idaho applied for Race to the Top in January of 2010 we agreed to “fully implement a statewide longitudinal data system (SLDS).”10 Idaho, in 2009 applied for a federal grant to complete this system. “Idaho was one of the last states to fully implement a SLDS.” “Idaho’s SLDS will house data for research and federal reporting requirements.” 11 Idaho also agreed to “ensure that this data was accessible to, and used to inform and engage, as appropriate, key stakeholders (e.g. parents, students, teachers, principals, LEA leaders, community members, unions, researchers, and policy makers);…and make it available and accessible to researchers so they have detailed information with which to evaluate the effectiveness of…strategies, and approaches to educating different types of students.” 12 In meeting this requirement, our State Department of Education committed to implement a system to allow the exchange of “individual level” student data, subject only to the limitations and procedures provided for in FERPA (Family Educational Rights and Privacy) law. On December 2, 2011 the U.S. Department of Education issued final regulations implementing amendments to the FERPA Act. These changes significantly reduced the privacy rights of students by redefining terms. The most significant change was to section 99.31, which gave school officials the ability to release personally identifiable information without parental consent.13 It also defines personally identifiable information as including but not limited to “ student name, student’s social security number, or biometric record.” Record is defined as any information recorded in any way, including but not limited to handwriting, print, computer media, video or audiotape, and film. This is particularly distressing when combined with the mandate from the U.S Department of Education to make student level data available for reporting and research. SDOE Myth: The adoption of these new standards will eliminate school choice options in public education. SDOE Fact: These are academic standards that set goals for what each student should know and be able to do by the end of each grade level. These standards are in no way tied to school choice options. Every public school, including schools of choice, will teach these new standards beginning next school year. Choice within public education is in fact alive and thriving in Idaho. Four new public charter schools are scheduled to open next school year to bring the total number of public charter schools in Idaho to 46. Idaho currently has 23 magnet schools or programs operating in the state along with 10 focus schools or programs. Many districts also offer alternative schools or academies as another choice. These are just a few examples of school choice in public education in Idaho. Documented Fact: With the adoption of the Common Core State Standards (CCSS), we also agreed to adopt uniform assessments. These assessments are being written by the SBAC. Idaho has one vote in this Consortium, and has agreed to use the assessment system developed by the Consortium.14 All State schools will be required to participate in these assessments. These assessments will drive curriculum. “High-stakes testing has enormous influence on teaching and learning in classrooms-for better or for worse.” The intent of the SBAC is to “link these assessments to curriculum and classroom learning”.15 All of Idaho’s state schools will be required to use the CCSS standards and assessments. The SBAC has produced Content Mapping and Content Specifications with the express purpose of, “providing clear and rigorous prioritized assessment targets that will be used to translate the grade-level Common Core standards into content frameworks from which test blueprints will be established.”16 The SBAC have already been deciding which of the standards are the most important and what will be stressed in the classroom. We will have school choice, if choice means choosing between different CCSS schools. SDOE Myth: These new standards will de-emphasize literature, like Huckleberry Finn, and historical texts, such as the Gettysburg Address. SDOE Fact: These standards actually emphasize reading and writing skills across all subject areas, not just in English language arts classrooms. These new standards ensure students in public high schools receive a well-rounded education in learning both literary texts as well as informational texts. The business community in Idaho and across the country has told us that students need to be prepared to read, write and analyze informational texts before they graduate from high school. We know this is a critical skill in the workforce and have to make sure Idaho students are prepared to meet it. In addition, the standards include literacy standards for history and other subject areas to make sure historical texts are incorporated throughout a student’s education. SDOE Fact: These standards are in line with the Idaho Math Initiative that Idaho implemented back in 2008. Research has shown that teachers who have taken the Mathematical Thinking for Instruction course through the Idaho Math Initiative and applied these methods in their classrooms see better student achievement results in mathematics. A primary reason Idaho chose to adopt these new standards is because they aligned well with what we were already doing in our schools. Through these new standards, Idaho students will learn critical thinking and problem-solving skills that we believe are important now and in the future. SDOE Myth: These new standards were developed by private interest groups based in Washington, D.C.
SDOE Fact: The new standards were developed by states. The Council of Chief State School Officers and the National Governor’s Association are two state-led organizations that facilitated this state-led effort. The members of these organizations are state education chiefs, such as Superintendent Luna, and state governors, such as Governor C.L. “Butch” Otter, respectively. SDOE Myth: States are not allowed to change anything in the standards after they adopt them. SDOE Fact: These are Idaho Core Standards, and Idaho is ultimately in control of these standards. Each state has the flexibility to add on to these standards if it sees fit. In addition, local school boards have the flexibility to add on to these standards at the local level as well. Documented Fact: These Common Core Standards are not Idaho’s standards. We have agreed to adopt them as a whole. The copyright is owned by the National Governor’s Association and the Council of Chief State School Officers. Achieve Inc, in the publication On the Road to Implementation informs, “States should generate a list of their state standards not included in the CCSS. This list will identify the content unique to the state. The state needs to carefully consider whether any of this content rises to the level of consideration for the 15% guideline. States are likely to find that most of the content not included in the CCSS is extraneous and easily discarded”24 “If any individual standard is left out states will not be considered as having adopted the CCSS.” States are allowed to augment the standards with an additional 15% of content that a state feels imperative. States should be judicious about adding content and keep in mind the implications of doing so.” 25 Each state and Local school board can add 15% not remove any of these standards. These are not Idaho’s locally developed standards. SDOE Myth: This effort will lead to a national curriculum because standards drive curriculum. SDOE Fact: In Idaho, the state sets academic standards, or the goals for what each child should know and be able to do by the end of each grade level. The curriculum is set at the local level by locally elected school boards. This process will remain in place under the new standards. Local school districts and public charter schools will determine the best curriculum to help the teachers in their schools teach these new academic standards. Local school districts have asked the state to provide examples of curricular materials that are aligned with the new academic standards, and the state plans to provide examples to meet district requests. However, it remains up to each local school district to select curriculum, not the state or federal government. Documented Fact: Achieve Inc, instructs, “states will need to modify or create new curriculum frameworks and instructional materials to match the Common Core State Standards, states will also need to significantly alter their assessments to ensure alignment with the CCSS.” These Common tests will lead to a common Curriculum. The Smarter Balanced Consortiums documents,“ High-Stakes testing has enormous influence on teaching and learning in the classrooms- for better or for worse. Teachers give high priority to classroom activities that focus on the types of tasks in the test. ‘Tests worth teaching to’ seems to be an idea whose time has come.” They further recommend “linking high-stakes assessment to curriculum and classroom learning; and to provide training for designers of curriculum and assessments.”26 The stated goals of both the SBAC and Achieve, the authors of the Standards, is to have a curriculum aligned with the Assessments. There are several studies that document the effect of assessments on curriculum. “When policy-makers make decisions about the design of assessments, they will necessarily be making choices about what skills will be tested, and in the process will be privileging some curricular content represented in the assessment and ignoring other content that is not.”27 This is really common sense, teachers have to teach what is going to be tested. Idaho has one vote on the consortium that will design the Idaho assessments. Teachers, students, and parents will have no one to appeal to if these assessments are not affective at improving achievement. Who will the public hold accountable if our idea of what is important to be taught in the classroom does not line up with the assessment writers?